Ultra 95 Ceiling Mount | ICWUSA.com Inc. The Ultra 95 Ceiling Mount frees up precious wall space by mounting securely from the ceiling. It’s an excellent choice for medical operating rooms, dental operatories, and industrial/manufacturing applications. 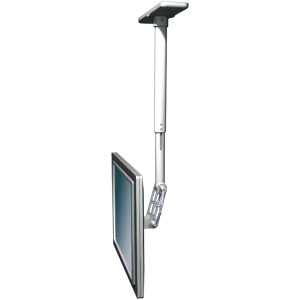 This arm swivels 360° at the ceiling and has 180° of screen tilt so you can position your monitor to the ideal viewing angle. Two joints offer additional monitor angle adjustments, adjust easily, and lock securely into position.